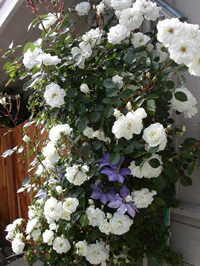 The climbing rose Lace Cascade was first bred in the United States by William Warriner and was later introduced to market by Bear Creek Gardens. William Warriner, who died in 1991 spent 25 years working for Jackson & Perkins and is given the credit of raising at least one hundred and fifty different rose varieties during his tenure. Lace Cascade was created by crossing the floribunda Iceberg rose, with the Prairie Fire rose. 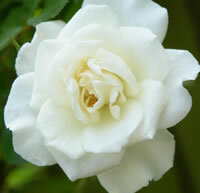 The result is an elegant white climber that has a somewhat mild fragrance. Lace Cascade roses will grow about 10 to 12 feet tall at full maturity, with dark green leaves that have a glossy texture to them. The blooms on this rose will average about 2.75 inches in diameter and will be somewhat full in shape, having up to 25 petals each. 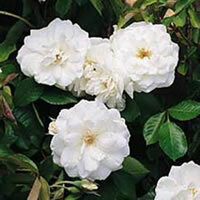 The rose Lace Cascade is considered a pretty hardy rose and it will do very well in zones 5 and up. This climbing rose is also very resistant to diseases, which makes it a favorite among growers who prefer low maintenance plants. The rose Lace Cascade is a repeat bloomer which means that it will do its best work if you can provide it with a location that gets as much sun light as possible. At a minimum, you will want to give it at least 6 to 8 hours each day of direct sun light. Where possible, try to pick a location that gets exposure to the full morning sun as this will help greatly towards drying out the morning dew and keeping the leaves of your roses that much healthier. 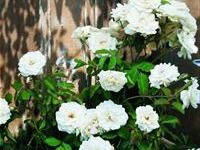 Lace Cascade roses should also be grown in a spot where the soil drains well. As a general rule of thumb, roses do not perform very well if they are placed into a spot where the soil stays damp for long periods of time. This will open them up to all sorts of various pests and diseases that thrive in these conditions. Another good way to keep your rose Lace Cascade healthy is to pick a spot that gets great air circulation through your garden. When air can move through and around your roses, this also helps to dry out the leaves even further. Planting the rose Lace Cascade is pretty easy and all you need to get the job done are a few basic hand tools that every gardener already has so we won't bother listing them here. Before you start digging, do yourself a favor and take a trip to the local garden center and pick up a bag of a good organic compost. This stuff is amazing for planting new roses and when you dig the hole, mix the compost in with the loose soil at a ratio of 1 part compost for every 2 parts soil. How you go about planting your Lace Cascade roses depends a bit on how and where you purchased them. If you were able to find them locally, then chances are they were already planted in containers and probably blooming. These are the easiest to plant because the guesswork is already done for you. All you need to do is dig yourself a hole that is at least twice the diameter of the container your rose Lace Cascade came in, and equally as deep. This will give you plenty of room around the root ball for your new soil mix, while still keeping the bud union at the same depth it was in the container. This is very important. If you ordered your rose Lace Cascade online however, then it was most likely shipped to you as a bareroot plant. The first thing you'll have to do is soak the plant overnight in a bucket of lukewarm water to help rehydrate it, prior to planting day. Then you will need to dig yourself a hole that is as wide as the longest roots on the plant, and deep enough to allow you to set the plant atop a mound of soil and still keep the bud union about an inch or two below the surface of the soil. Once you have your rose Lace Cascade set in place, spread the roots out in all directions down the sides of the mound and then back fill the hole only halfway to start, using your new soil mix. Take the garden hose and water the loose soil heavily until it flows around the roots like mud. Then go ahead and back fill the hole the rest of the way. Water the soil one more time heavily and top off any final settling that may have occurred. This should ensure that the plant is properly seated and no air pockets have formed. It is also recommended that you mound up some soil or mulch around the exposed canes until new growth as formed. This will help prevent them from drying out and you can remove the mound once the growth has formed. Taking care of the rose Lace Cascade is pretty straight forward and you can follow typical guidelines for caring for roses. The most important thing is making sure that your roses get the proper amount of water, without overdoing it. A good rule of thumb for most climates is to give your roses one deep watering each week. If you live in an unusually hot or dry climate, then you might have to step it up to every 4 to 5 days. You should also give your Lace Cascade roses a dose of a good all-purpose granular fertilizer in early spring when the leaves start to form. Since the rose Lace Cascade is a repeat bloomer, it will benefit greatly from additional feedings over the course of the growing season. I will usually give a second feeding right before the first big bloom forms. Then I will follow up with a 3rd feeding around the middle of summer to help encourage additional blooms later in the season. You should prune your Lace Cascade in early spring before the leaves start to bud. Start by removing all the dead wood from the plant, along with any canes that look discolored from disease. Next, prune back any lateral canes that overlap one another as these will start to compete for sun light once the leaves open up. 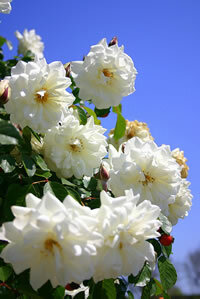 Lastly, give this climbing rose a very light pruning for shape, and to promote new growth. This is also the time to rake up around the base of your roses to clean up all the dead leaves and debris left over from the previous season. Throw away all this material in the trash, along with your cuttings. Never let decaying matter lay around the base of your roses and never throw rose cuttings into the compost pile. I always finish up by giving my roses a fresh layer of new mulch to start off the growing season.